The moment the train leaves the station without engineer Odd Horten aboard, he realizes that the path ahead is a journey without printed timetables and well-known stations. Horten has been forced to retire after 40 years of traveling a very stable rail, and the platform does not feel like a safe place anymore. His orderly, solitary existence is about to give way to a future of unlikely adventures and puzzling dilemmas. Will Horten ever travel by plane? Will he finally sell his prized boat? How does Horten end up in a pair of women's red high-heeled shoes? Will he survive a nighttime drive with a blindfolded man at the wheel? Proof positive that there is humor to be found in aging, and that we don't have to be elderly Norwegians to identify, laugh and embrace life in all of its idiosyncratic splendor. 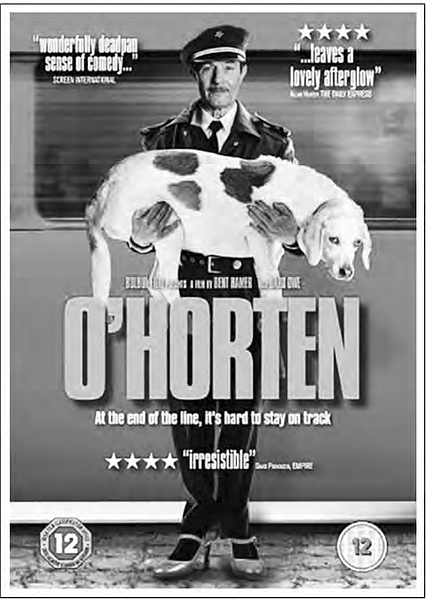 O’Horten is Bent Hamer's wonderfully skewed view of the human condition. It gives us a somewhat absurdist vision with great warmth, a little melancholy and universal appeal. The film evokes such love and appreciation for Horten that it’s almost like an artwork you can just sit back and enjoy. Every individual can admire this because it has so much to offer with its emotion and outlook on life. The film kicks off with a wonderful journey through the mountains and tunnels that make up Odd’s (a common name in Norway) route. He is played by Baard Owe, a trim, fit man with a neat mustache who may cause you to think a little of James Stewart, Jacques Tati or Jean Rochefort. His portrayal of the humble and quiet Horten is definitely impressive, as is the score that adds a wonderful touch to many of these magical scenes. The material might tempt some filmmakers to wallow in whimsy, but writer-director Bent Hamer (Kitchen Stories) holds steady. It is a quiet, oddly serene movie with a curious soul. That soul will be bared on Saturday, May 20 at 5:00 pm when the Palisades library, in conjunction with Sony Picture Classics, hosts a screening of the film. All aboard!